Evolution (2nd Edition), by North Star Games (http://www.northstargames.com), 2015 [ages 12+, 30-minute play time, 2-6 players] $54.99. In the game of life, survival is key. And that’s not so different in the board game Evolution, the breakthrough Kickstarter success story in its second edition by North Star Games whose very DNA mimics our dog-eat-dog world. As the game begins, each player takes charge of a new “species.” During each player’s turn, the species in their hand can be enhanced by playing or trading trait cards. Trading in a card to level up a species’ body size or population size makes them harder to be attacked or driven to extinction, but doing so comes with the added burden of needing additional food to sustain them. Playing a trait card confers that species with unique abilities that help them collect extra food (e.g. “scavenger,” “long neck,” and “fat tissue”), fend off attacks (e.g. “climbing,” “hard shell,” and “warning call”), or attack other species (e.g. “ambush,” “pack hunting,” or “carnivore”). Each species is limited to three unique traits, but these cards can be swapped throughout the game to “evolve” in response to the competition as new species come and go. In lieu of leveling-up the prehensile proto-llama or feathered faux-ferret you’ve created, each player also has the option of instead adding a new species to their hand to create various amalgams. And with every new species spawned (and their numbers grow), the food begins to dwindle as the watering hole gets that much more crowded. Because Evolution‘s game mechanics allow enough plasticity to repeatedly reboot or rebrand any number of species combos, the game play continues to change as different species thrive or fade to extinction. With a swap of one trait card you can transmorgify your seed-gathering arboreal pocket mouse into a blood-thirsty carnivorous arboreal pocket mouse who, because strength lies in numbers, may be the downfall of an opponent’s saber-toothed salamander. Especially for those with a science background, it’s hard not to try and imagine real life examples of the pseudo-species you’ve created in the petri dish that is your “hand” of species. Whatever hand you’re dealt, you had better hope it has teeth because when the food runs out, no one is safe. As players fight to evolve or eliminate the competition, they may have to cannibalize their own creations to become the last pygmy manatee standing in a playing field truly red in tooth and claw (or, if you play your cards right, hoof and trunk). Evolution’s game play is so carefully crafted and expertly executed, it appears to have been lifted straight from the pages of Biology 101. Inhabiting a unique niche among board games as both tool and toy, Evolution has no equal. Imagine a lesson plan so addictive and so illustrative, the act of learning – a journey of enlightenment about species interactions, competition, and survival – unfolds unconsciously. One can only imagine the trajectory scientific progress might have taken if the Beagle’s own Charles Darwin and Captain FitzRoy had sat down to tinker with this board game in the captain’s parlor during their long voyage at sea instead of frolicking after a few fickle finches. Helium balloons pose a unique threat to wildlife and the environment. When released outdoors, the balloons eventually shatter and/or fall to earth, where the latex fragments are often mistaken by wildlife as food, or individuals become entangled in the strings or latex, leading to stress, injury, malnutrition, and sometimes death. What differentiates balloons from other garbage and debris, however, is that the very nature of their being – that they are filled with a gas lighter than air – not only allows them to stay airborne and disperse farther distances from their point of origin than might otherwise occur with a discarded straw or plastic bag, but also disperse to higher altitudes where latex balloons undergo an explosive “brittle fracture” that results in both large and micro material that fall to earth, making it difficult to track their fate. As one who spends time outdoors, the number of spent balloons I’ve found littering my favorite open spaces has left me with a bitter taste in my mouth. If you throw a plastic grocery bag on the ground, there are few among us who would dispute that the very act constitutes littering. So what makes balloons any different? Whether you are in an urban or open space (the woods, the beach, the desert, the city, or your backyard), keep an eye out for latex and mylar balloons. Take a photo of any balloon you encounter with the Litterati app and tag it with #mcd, as well as #latexballoon or #mylarballoon. Properly dispose of any garbage you collect. As you collect and record balloon trash, you will be contributing to a growing open source database that will help future policy makers begin a meaningful dialogue about the consequences of balloon releases based on hard facts. Although the balloon industry maintains that latex balloons are made out of natural latex and are, thus, biodegradable, it can still take 8-10 weeks when exposed to air and more than 5 months when submerged in water before a latex balloon degrades and breaks down. That leaves plenty of time for wildlife to ingest them. The inadvertent and deceptive resemblance of anthropomorphic materials, structures, and systems to biological entities and processes. When balloons enter the natural environment, they become apatobiomimics: anthropomorphic materials that inadvertently and deceptively resemble biological entities or process. Among the species that are vulnerable to this bait and switch are marine birds and mammals, big horn sheep, and sea turtles and desert tortoises, many of which are threatened or endangered species. It’s true that what goes up, must come down – but when balloons fall to earth, the consequences can be fatal. If you are interested in learning more about the #mcd project or how balloons impact the environment and wildlife, visit: https://balloonsmcd.wordpress.com/. Since 2012, when the Cornell Lab of Ornithology first reported the development of Merlin™, an online bird identification tool, Cornell’s All About Birds Labs has been hard at work adding bells and whistles to Merlin’s know-how. Through collaboration with Visipedia, this summer The Cornell Lab of Ornithology announced the debut of their new computer vision technology app, Merlin Bird Photo ID. And wouldn’t you know it, the app does exactly what its name suggests – identifies birds in photographs. Using the online Merlin Bird Photo ID tool is simple. Just drag and drop an image of any one of 400 North American bird species, identify when and where the photo was taken, drag a box identifying the bird from any background noise, and then click on the bill tip, eye, and tail tip to give Merlin a hint. Digging through some crummy bird photos I have taken over the years, I decided to put Merlin (and my photography) to the test to see how well it performed. 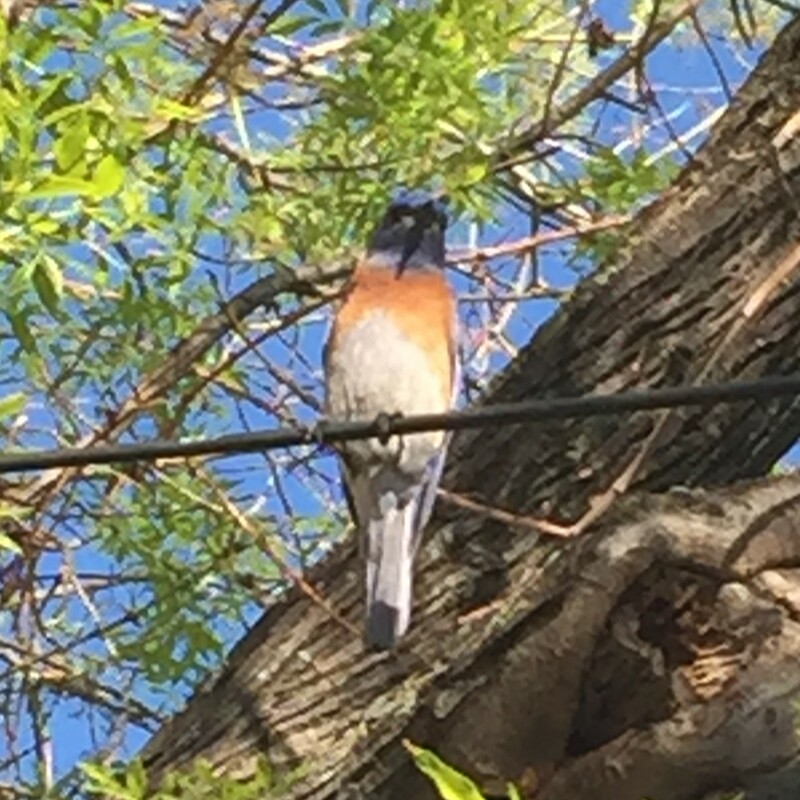 Discussion: Having seen these fellows in my yard all spring, I knew beforehand that this neighborhood regular was a western bluebird (Sialia mexicana), but because I maxed out the zoom feature on my old cell phone, the photo was left with a watercolor-esque dappling that I thought might confuse the computer vision algorithm’s at work here. Merlin’s best matches led with a male hooded merganser (breeding male) and an adult American robin. Hopefully, anyone with any sense would know enough to dismiss those outright and click through to “More Results.” Still, even after fiddling with the settings several times (knowing that the first time I attempted to identify this bird a week ago, I remember western bluebird falling within the first ten suggestions, this time around western bluebird was Merlin’se 23rd choice. Clearly, the caveat that “high quality images of birds in typical poses work best” holds true here. Discussion: When I first caught a glimpse of this bird in flight at a distance in the Wind Wolves Preserve north of the Grapevine, for a moment I thought I might have seen something a little more exotic like a prairie or peregrine falcon; but deep down, I’ve always known this was an American kestrel (Falco sparverius). Merlin confirms it. Discussion: If you look closely, you’ll see this photo isn’t exactly fair – there aren’t one, but two birds awkwardly posed against the tree in this pine-oak woodland. When I first saw this pair of woodpeckers, what was most remarkable about them – second only to the outlandish ruckus they and their fledglings were raising at the time – was their remarkable size. 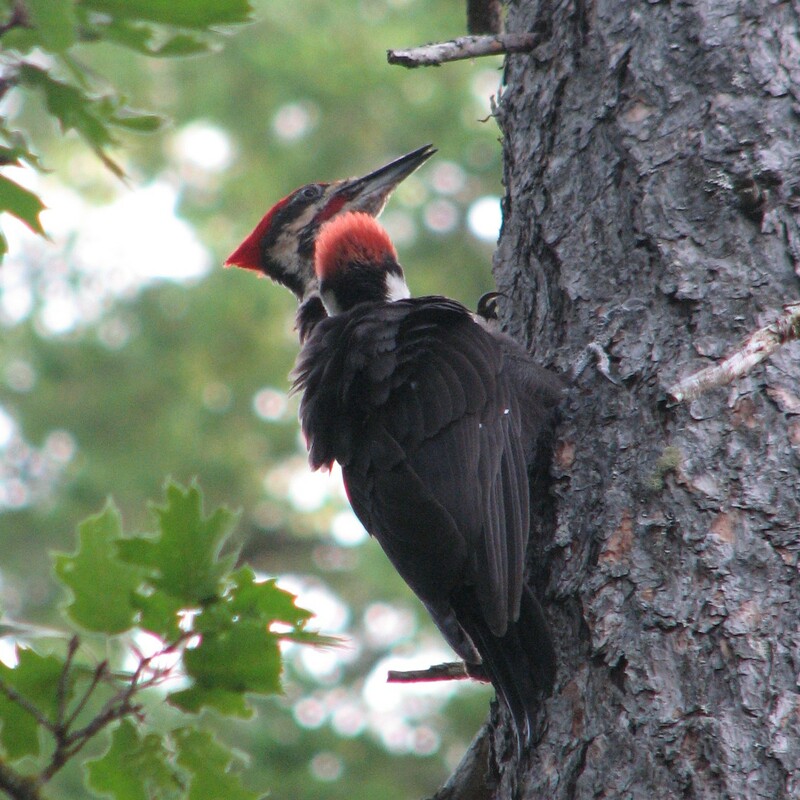 Seeing as how pileated woodpeckers (Hylatomus pileatus) are the largest woodpecker in the United States (second only to the presumed extinct ivory-billed woodpecker), their size is one of the primary traits that makes them so easy to identify in the field. But, Merlin doesn’t know how big the bird in my photo was. Nevertheless, pileated woodpecker is Merlin’s first and only suggestion. 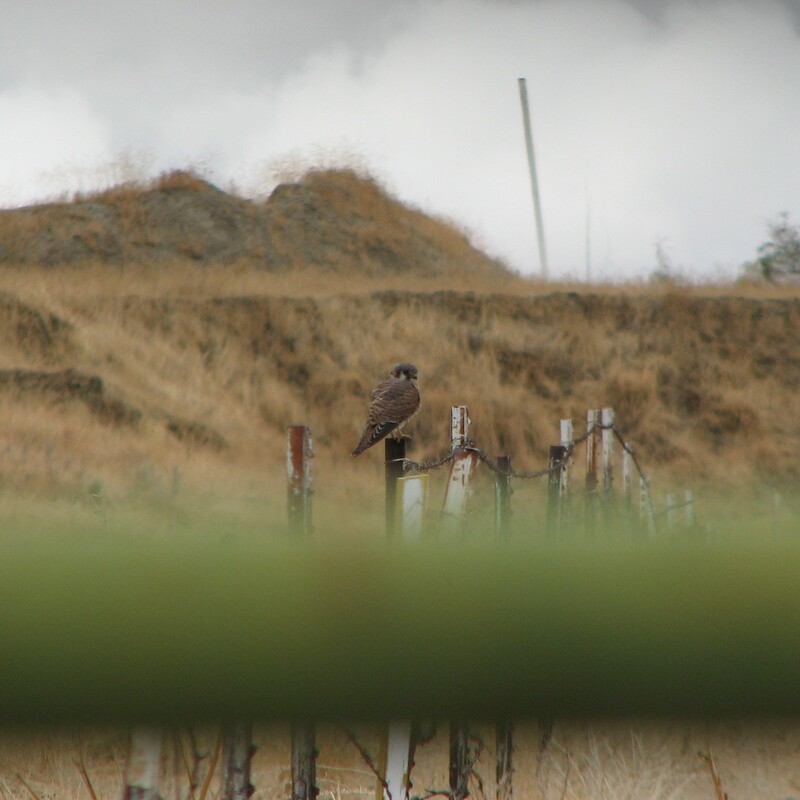 So despite my clumsy attempts at wildlife photography, Merlin Bird Photo ID pulls through in a pinch, even if it needs hand-holding when tricky photographs are at issue. In truth, that’s no different than catching a fleeting glimpse of a hooded sparrow and trying to narrow down your choices between a dark-eyed junco and a spotted towhee. Whether you are flipping between bird IDs suggested by Merlin or flipping between pages in your field guide, in the end it comes down to the birder to make the final call. You are currently browsing the archives for the Educational Material category.